As the world reacts to today’s nuclear agreement between the U.S. and its allies and Iran, a new 40-nation Pew Research Center survey finds that concern over Iran’s nuclear program is greater in the United States and Israel than among other global publics. In the U.S., 62% say they are very concerned about Iran’s nuclear program, with only ISIS ranking as a greater danger among seven global threats tested. About seven-in-ten Americans (68%) say they are very concerned about ISIS. Israelis rate Iran’s nuclear program as the single greatest global threat compared with other issues, with 53% registering a high level of concern. Spain is the only other country included in the survey in which as many as half (52%) say they are very concerned about Iran’s nuclear program. The survey was conducted in 40 countries among 45,435 respondents from March 25 to May 27, amid negotiations over the Iran agreement. Americans also have very different views about other global threats, such as cyberattacks and climate change, than do many other publics around the world. Nearly six-in-ten Americans (59%) are very concerned about cyberattacks. South Korea is the only other nation in which a majority (55%) views the threat of cyberattacks as a major concern. Global climate change is the top concern in 19 of the 40 nations surveyed. But in the U.S., just 42% say they are very concerned about global climate change. About as many (43%) say they are very concerned about tensions between Russia and its neighboring countries. Concern over climate change exceeds that for just one of the seven items tested in the U.S. survey: territorial disputes between China and its neighboring countries (30% very concerned). As Pew Research Center has noted, there are substantial partisan and ideological divisions over the issue of climate change. For Democrats, global climate change is among their top international worries: 62% of Democrats say they are very concerned about the issue. Comparable shares of Democrats say they are very concerned about ISIS (64%) and the threat of cyberattacks on government and institutions (60%). 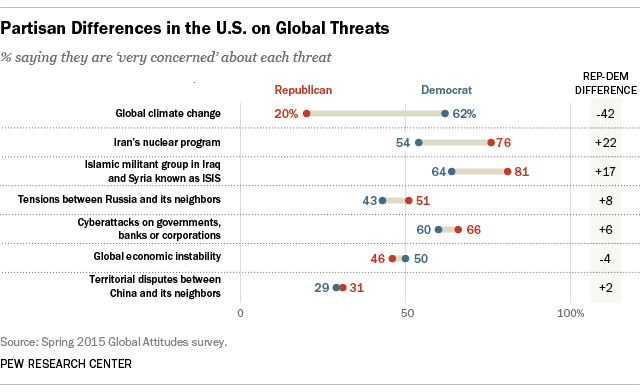 By contrast, just 20% of Republicans say they are very concerned about global climate change. A majority of Republicans perceive ISIS (81% very concerned) and Iran’s nuclear program (76%) as the two top global threats. There are also sizable age differences in the perceptions of global threats among the American public, a phenomenon that is seen in other advanced economies. No single threat stands out as a top concern for those younger than 30: 49% say they are very concerned about global economic instability, while nearly as many say the same about ISIS (47%) and global climate change (46%). 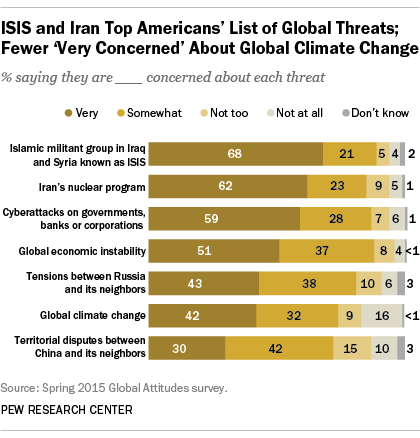 Older adults are much more concerned about Iran and ISIS, in particular. Majorities across older age groups say they are very concerned about both of these threats. Among young people, just 40% are very concerned about Iran’s nuclear program and 47% are very concerned about ISIS.